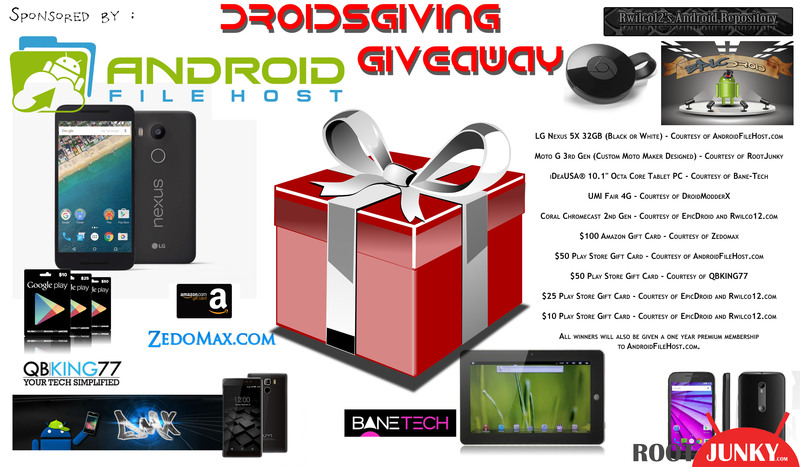 We’ve had a lot of positive feedback about the Droidsgiving giveaway. It seems like everybody wants to get in and start getting their entries right away! We thought about it for a bit, then we talked it over and then we decided that in the spirit of Droidsgiving we would kick it off early! Originally the plan was to start it on the 1st but we will instead be giving you all three and a half extra days to get as many entries as possible. The giveaway will still close on 12/7/15 at 11:59 PM MST. Winners will be announced shortly after the 7th. There are over $1000 worth of prizes here! We are super excited for this giveaway and can’t wait to see who wins! Once again, this Droidsgiving giveaway would not be possible without all of you. You have helped all of us sponsors where we are today and we thank you for it. We hope to do many more of these giveaways in the future! Check out the list of prizes and the sponsors and then enter the drawing below! Thanks, i am telling all of my friendas about this awesome giveaway!